Hanna took everyone on a whirlwind journey through time which left the audience in no doubt of the need for best scientific practices and meticulously recorded statistics. Hanna explained, “The lesson of bloodletting is arguably the most important lesson in the history of medicine, yet it has been largely forgotten. This leaves us in the unenviable position of making the same mistakes, for the same reasons, and with the same unjustified sense of certainty in our beliefs, despite access to better information. Anyone who is genuinely interested in the well-being of their patients must take this lesson seriously.” Hanna also reminded the participants that many modern pharmaceuticals originated from natural sources, citing an example of aspirin’s origin from the willow tree. By the end of his talk, listeners knew of many criteria to look for in valid studies. Hanna set the tone to keep an open mind but gave the audience some tools to assess credibility. Holly Barnett REMT CSF, explains the benefits of adding massage therapy to your horse health care team. Bone cracking myths were dispelled as Dr. Scott Hie, D.C. Chiropractor, went on to educate the crowd about what an adjustment is, and when it is useful. Restriction and lack of motion were the symptoms Hie stated as reasons to see a Chiropractor? but not before seeing a vet. Hie laughs at some of the misunderstandings that often surround his practice and recommends, “If your horse has a bone out of place – call a surgeon!” Hieexplained an adjustment as a high velocity, low amplitude thrust. The audience was encouraged to call their vets first and then seek out registered professionals from sites like www.veterinary chiropractic.ca. Hie reiterated the importance of teamwork between the vet, farrier, saddle fitter, massage therapist, nutritionist and chiropractor in addition to seeking out evidence-based knowledge. Feedback was resounding that more of this knowledge would be useful as listeners learned many of the examples of what not to do! Hie let everyone know chiropractic is not an option when there is severe heat, swelling, lameness or open wounds. 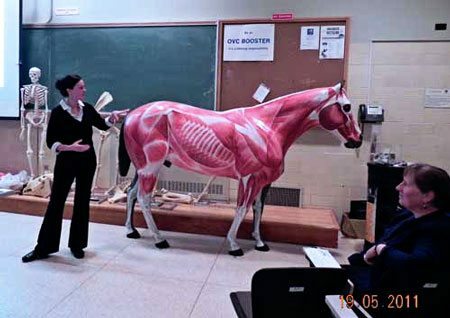 Participants interested in learning more about how the joints are connected were encouraged to check out Equine Guelph’s Anatomy course or seminars. The search for symmetry followed with a hands-on talk by Holly Barnett, REMT CSF, massage therapist. With over 80 modalities of recognized massage, this speech left the audience wanting to learn more about trigger points and how to relieve those pesky knots. Everything from chronic tension to muscle spasms and rehabilitation were covered as reasons to employ a registered massage therapist (info can be found on sites likewww.ifremt.org). Barnett also encouraged participants to utilize their health care team by seeking out the vet first and expanded upon the importance of a qualified saddle fitter as many muscular problems begin with incorrect saddle fit. Barnett instructed horse owners to “look for symmetry” and gave many tips on how to palpate and stretch horses to help combat what can become a vicious cycle of pain and muscle contraction.